We are very pleased to share with you a most beautiful Craftsman style porch and Craftsman architecture along with a wonderful flower garden that belongs to our friend Anna of Flowergardengirl. Mary and I love Craftsman homes and know you'll enjoy seeing Anna's. 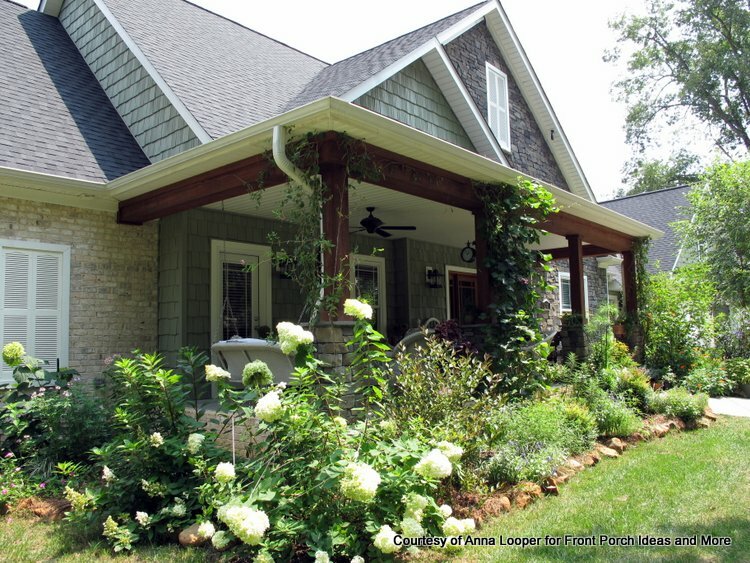 Anna lives with her husband in a beautiful new Craftsman style home that Anna designed. Their home is located in North Carolina. Except for a short 20 years traveling with her husband during his Air Force career, Anna has always lived in North Carolina. Her family goes back to the mid 1600's to this area. Mary: Just looking at your porch photos was very relaxing for me. Anna: That means a lot to me as I am very serious about porch time with friends. I'm so glad you love my Craftsman style porch! Mary: Yes, and your home is simply beautiful! What inspired you to design a Craftsman style home and porch? Anna: I'm from this area and there is a strong Craftsman style look to many of the older homes that I grew up in. My great uncle built several of them. Having wonderful memories of wide front porches where everyone enjoyed great food and conversation has stuck lovingly to my character. I carried those memories around with me from the time I got married until I returned home after my husband's Air Force career in 1994. I have always known how I wanted my home to look and how wide the porches needed to be. 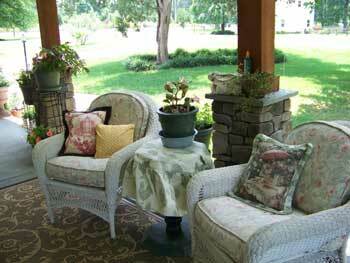 Both front and back porches accommodate plenty of space to spread out and get comfortable in a rocker or a swing. Even though we retired in 1994 from the service, we could not afford to build this home until 2008. I was willing to wait until I could add all the Craftsman style features stored away in my brain for future design. My home also has a Moravian flare with its arched inner doors and cottage personality - flowing gardens and quaint seating areas. My home is all about entertaining so the outdoors meets the inside aroma of home cooking. When my family is all gathered here, we spill out to the porches and someone is always in a swing. I have three porch swings and plenty of rocking chairs, too. We have three big porches - one on the front and two off the back. One is a screened porch off the entire back family room. Mary: We love your Craftsman style front porch. It's a great outdoor room from the bead board ceiling and the comfortable wicker chairs and porch swing to the wonderful flowers and rug. 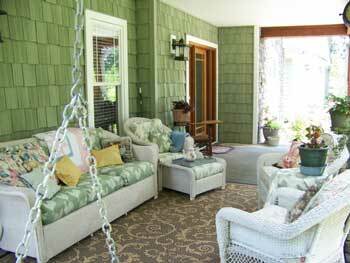 The green shakes on your home really add a lot of color and ambiance to your porch as well. 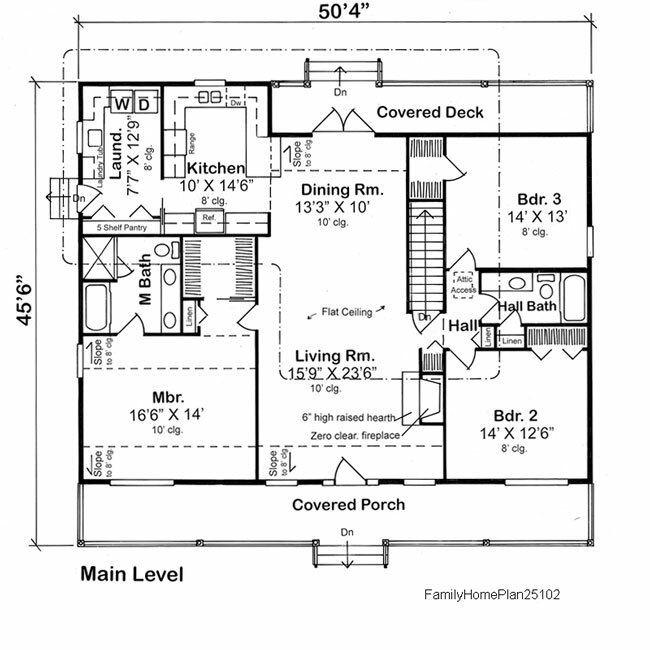 Would you tell us a bit more about the layout and the furnishings of your Craftsman style porch? Anna: Over the years I have collected odd bits of wicker. I have also saved up assorted materials that complement each other to create a cottage look. I like to hug a pillow while I sit and read we have many pillows covered in an assortment of patterns. I have spoiled my family with plush places to sit so the cushions are a bit on the soft side. If they come to visit then it's my goal to make it hard for them to leave. I have even got afghans out there for my daughter-in-law who stays on the chilly side. I am a gardener and have always loved the color sage green so even the cedar shakes on the porch are that beautiful color. I'm a nature lover so sage green fits my personality. I think it's such a quiet color and we've used it throughout our home. The layout of the porch had to be big enough for seating on both sides of the porch and include room for the swing. I like to sit across from the person I'm talking to. A porch needs to be wide to allow for that. The outdoor rug makes it an outdoor room just like you'd have in a real living room. That area will forever change as the cushions are traded out during the seasons and I like to create different looks. I have plans to put a book shelf out there and fill it with gardening books. Mary: We love the abundance of comfort and hospitality of your front porch. 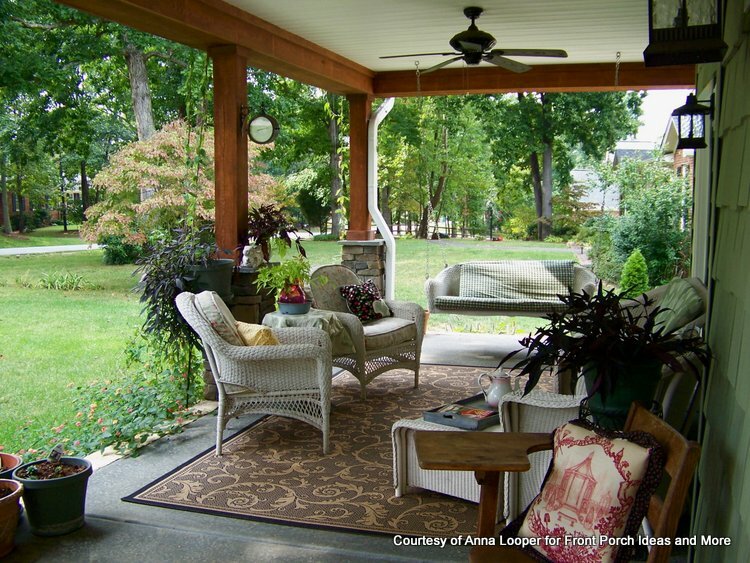 Have porches always been a part of your life? Anna: Yes, I come from a long line of porch people. My grandmother and great aunt were master porch sitters and decorators. They did not have air conditioners so being outside was the most comfortable place to be. They were also outgoing and talked every chance they got about the neighborhood gossip. I'm no different and attract people like flies on a doughnut. We women of the porch sitting society are serious about our refreshments and linens for the occasion. I have recently been sewing up some pretty napkins for a few teas I will be hosting soon. And, of course, I keep the everyday napkins around for those that drop by. I want to be ready no matter the visitor or time of day. Tea is always ready. I got so excited this week cause I found a place that sells pretty tea cups in floral patterns. I also serve iced tea and little cakes that take the edge off a otherwise grumpy hot day. "Porch sitting is more an occupation in my life. Its a destination almost every afternoon soon as supper is finished. And all day long, I think of things that will be interesting and fun to talk about. No use sitting on the porch if there is going to be an awkward silence." Mary: You mention in your blog that you sewed the cushions for your wicker furniture. Please describe how you made those. The fabric is gorgeous. You also mentioned that you can put them in the washer. Do you mean the cushion covers? Do they just slip off? That's a great idea to be able to wash your cushions. Anna: Oh yes, you have to be able to wash your cushions in this hot humid south. I sew the cushion covers like envelopes that overlap. I leave the seam open in the back and stuff the content inside. I sometimes secure it closed with a button latch. You make the covers by taking one long piece of fabric the width of your cushion. The length must go around the cushion and overlap a good bit in the back. Fold down the ends and bring them around so they overlap. Sew right side together at the side seams. What you end up with is a oblong square with an open back where the pillow is inserted. It rarely needs a closure if the fit is not too tight. I try to use pretty but inexpensive sheets. Right now I have a pretty tapestry material I bartered for when I made a shop owner her entry flower containers. It was a good deal for both of us. Mary: Your flower gardens are awesome. Have you always had a green thumb, Anna? 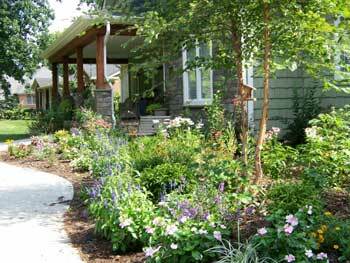 For someone wanting a lovely, colorful cottage garden around their porch that does not require too much fuss, do you have some suggestions for plants? 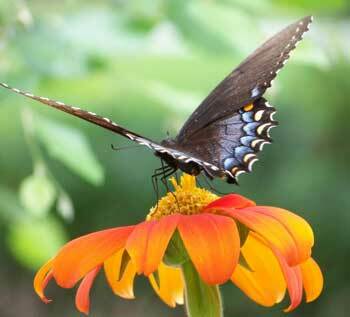 We'd appreciate any advice you can give for keeping a flower garden looking great. Anna: I can't give you an easy answer but I will try to give you a workable one. Most important thing is to have the best soil. Amend it highly with leaf mulch. 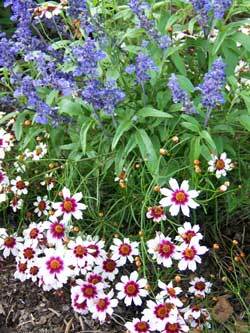 Give it a good dose of Espoma Plant Tone, and then feed your annuals weekly for a good show. All that preparation is keep to less trouble. The mulch will keep aggressive weeds out. 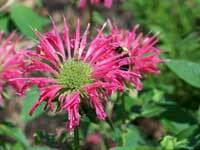 I like tall garden verbena, knock-Out roses, zinnias, phlox, lantana, hollyhocks, some evergreen shrubs, hydrangeas, and crepe myrtles. The garden is key to a successful porch. 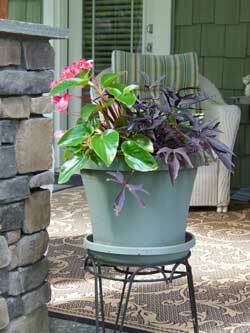 The potted flowers on the porch need to have a good scent, color, texture, and history. Plenty of old fashioned plants to make it authentic." Mary: Anything else you want to share about your lovely craftsman style porch? Sounds like you and your husband spend a lot of time on your porch eating, relaxing and enjoying the view. What a wonderful place to be. Any special events or celebrations on your porch? Anna:We always have my birthday out there cause it's my first choice. My daughter in law does too. This weekend it was the 4th of July and we had our dessert out there. My son's birthday cake was eaten on the screened back porch where there is a full dining table set up under the two ceiling fans. We used all our porches this weekend and it was very comfortable. My husband and I almost always take our dessert out to eat in the swing. If it's not too buggy we eat on the front porch, otherwise we retreat to the screened porch. Mary: And lastly, tell us a bit about your work putting together commercials. Your blog mentions that your commercial for the Briar Patch was to run during the Martha Stewart and Paula Deen shows. Tell us how you got started doing that and what vision you have for the next few years? Anna: I have worked for The Briar Patch Garden center since 1999 and there has grown a lot of trust between us. I have done some public speaking on their behalf and run their website for them. They have been pleased with my work and knew that I was able to put together pod casts. So they asked if I'd be willing to develop their commercials for them. I agreed and it has been fun. We will be doing other commercials for the coming fall and harvest season, one for Christmas, and then one to start off the 2010 What's New Program. The commercials air on our local Fox channel during Rachel Ray, Mike and Maty, and Martha Stewart. I take all the photos for the event, write the script, and put together the music and pod cast. That gets sent to the station for tweaking and it's a go. I hope to be asked to do more and have been putting together a few for my freelance writing site at The Charlotte History Examiner. Mary: Our many thanks, Anna! You're a very talented and gifted person. We appreciate having the opportunity to get a peek into your wonderful Craftsman style North Carolina porch and home. We hope you will let us come back! Anna: You are so welcome and I do hope you have me back. 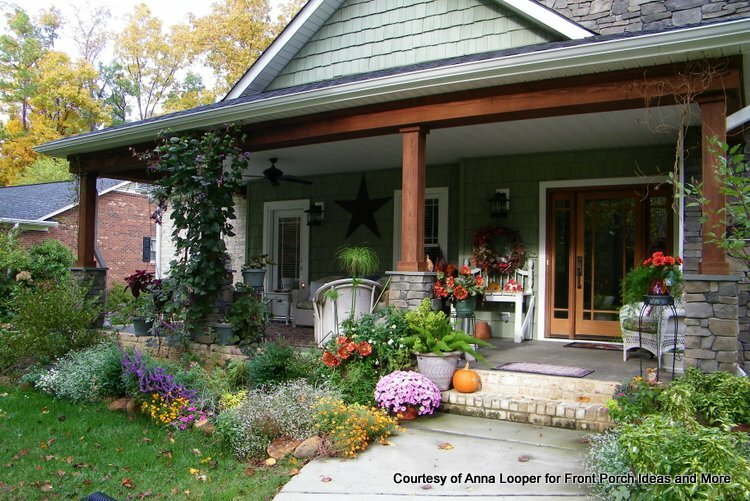 Love Anna's Craftsman style porch? See how she decorates with beautiful flowers.